If you are looking for laser toenail fungus removal near me, look no further than Beaver Valley Foot Clinic. Patients ask what is the best treatment for toenail fungus and are laser treatments effective for toenail fungus? 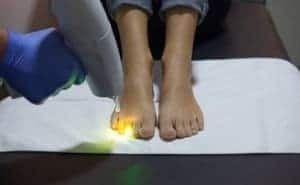 Also we get asked “Can you cure toenail fungus with laser? and Does laser treatment for toenail fungus work?” The answer is a resounding YES! With our laser toenail fungus packages the laser treatment for toenail fungus success rate is very high. How much is laser treatment for toenail fungus? It depends on how many toes are affected. An exam by a podiatrist often can show a person fungal infections patients didn’t even know they have, one just has to know where to look and what they are looking at. What are laser treatment for toenail fungus side effects? None if done correctly and on the correct patient. This is where the podiatric exam becomes important.